These 8-inch mini bolt cutters are perfect for cutting small screws, nails and wire, whether you're working in your garden, in your garage workshop or on the job site. Compact and sturdy, their compound cutting action makes it easy to cut most soft and medium metals. 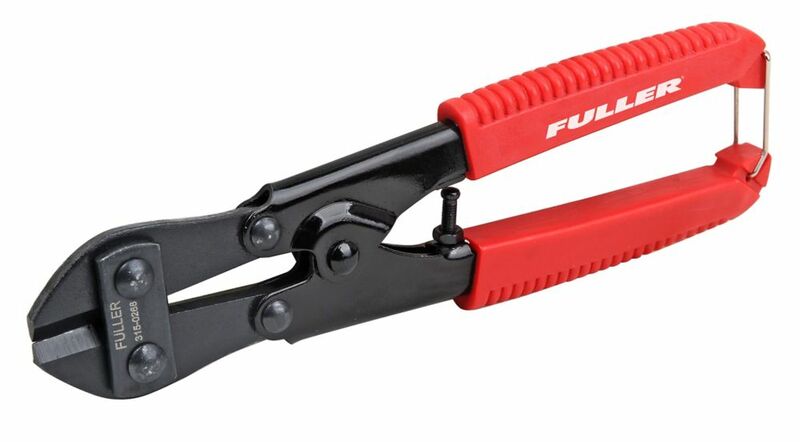 The centre-cut jaws of these 18-inch, professional quality bolt cutters are designed to chop through soft to medium-hard metals up to 5/6-inch thick. The heat-treated chrome-molybdenum jaws are engineered for long life, and lock plates prevent them from loosening with use. Featuring an adjustment screw for setting the position of the jaws when closed, and all-steel tubular handles with slip-proof rubber grips for comfort and security, these 18-inch pro bolt cutters fit easily into a toolbox or on a tool belt. Able to slice through bolts, rods and wires up to 9/16-inch thick, these 36-inch bolt cutters were engineered with professionals in mind: their heat-treated chrome-molybdenum jaws are designed to last; strong tubular handles with rubber grips prevent hands from slipping; and their compound cutting action provides extra cutting power with less strain. This bolt cutter is perfect for the professional or the do it yourselfer. Ruggedly built, they are ideal for cutting concrete reinforcing rods, medium tensile and soft bolts, rods, rivets, bars, chains, and cables. The versatile short cutting edge easily accommodates chain links. It features hold firm vinyl grips and a quality steel handle for powerful sure cutting. Since our founding in 1882 Knipex Tools has become the worlds largest manufacturer of professional pliers. Knipex Pliers, Cutters, Insulated Tools and other products have been the tools of choice for Professional Tradesmen and end users who are serious about their hand tools and demand industrial quality. Knipex Tools are made from start to finish utilizing the highest quality materials. Based in Germany, KNIPEX Tools are German engineered to produce a tool unmatched in the industry in terms of features, comfort, design and performance. The 95 61 190 is a 7-1/2 In hand held Wire Rope Cutter. Shearing action produces clean precise cuts. Easily cuts bicycle cable, wire rope, etc. Pro Series 8-inch Mini Bolt Cutter for Small Screws, Nails and Wire These 8-inch mini bolt cutters are perfect for cutting small screws, nails and wire, whether you're working in your garden, in your garage workshop or on the job site. Compact and sturdy, their compound cutting action makes it easy to cut most soft and medium metals.